Lock in a great price for Cathedral Gate – rated 8.9 by recent guests! The rooms were comfortable. The staff was very friendly and helpful, offering to assist with luggage. 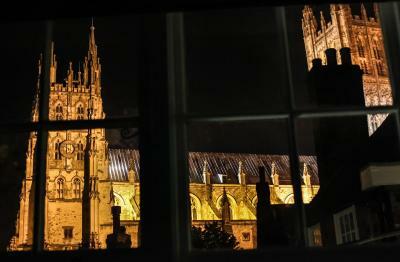 The rear rooms in the hotel have great views of the cathedral. The front rooms overlook a medieval market square. I loved my stay here. The location was fantastic, but the thing that struck me most was the friendliness of the staff! Monica on reception went above and beyond to make sure that I was comfortable. The check-in process was quick and easy, and I was made comfortable while my room was made ready as I had arrived early. I was lucky enough to receive a free upgrade, and my room was clean, spacious, warm, and very comfortable. Service was excellent and friendly. Continental breakfast was unbelievable. Food was fresh, delicious and you were treated to personal service, not like those serve yourself places. Lovely location looking down on butter market on one side and Canterbury Cathedral on the other. Weather was great and dry most of our 5 days. Many attractions were in walking distance. Punting on the Stour was a fun activity. Good restaurants were nearby. Wonderful trip, will return at first opportunity. Breakfast excellent cooked to order. Rooms very nicely appointed and clean. Staff very friendly and accommodating. Helped carry bags to room. Openable windows and a nice rooftop patio overlooking the cathedral. Very quaint place with lots of stairs. Staff was exceptional. Perfect location for viewing cathedral and old town. Great breakfast. Lots of atmosphere and literally next door to cathedral gate. Staff were very nice and helpful. We enjoyed the location and the charm of the hotel. Friendly staff. 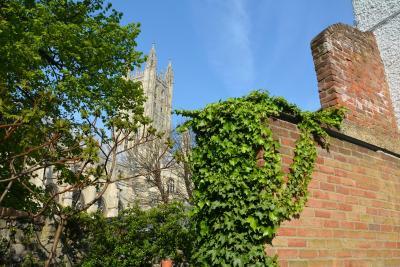 Cathedral Gate is a gem in the heart of downtown Canterbury. This place oozes with history. There are stairs going every which way and the rooms have names instead of numbers. There are amazing views of the Cathedral from may locations at the hotel (the lobby, the rooftop, certain rooms, etc.) and somehow the bathroom was very spacious despite how old the hotel is. You can't ask for a better location in the city. HIGHLY recommended. Cathedral Gate This rating is a reflection of how the property compares to the industry standard when it comes to price, facilities and services available. It's based on a self-evaluation by the property. Use this rating to help choose your stay! 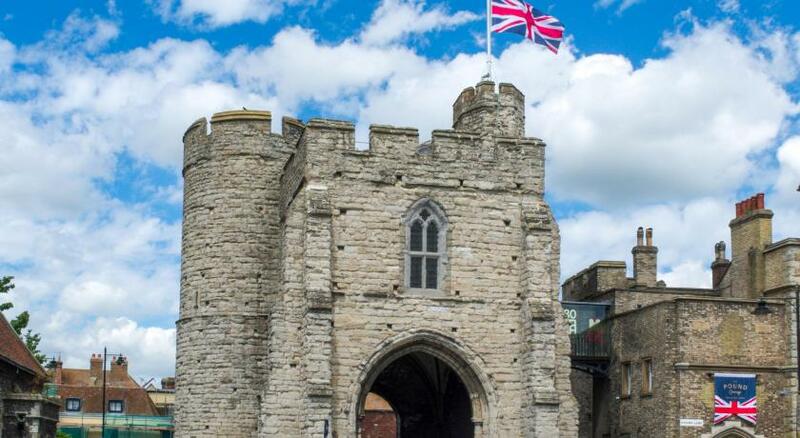 Dating back to 1438, the historic Cathedral Gate is in the heart of Canterbury. Once slept in by pilgrims, the hotel predates the adjoining gateway to Canterbury Cathedral and features wooden beams and sloping floors. The rooms feature a TV, telephone, and tea and coffee making facilities. Each room has a hairdryer, along with a shared or private bathroom. 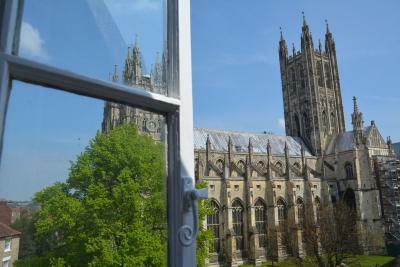 Some rooms have views of Canterbury Cathedral. In the mornings, Cathedral Gate serves continental breakfast. Full English breakfast is also available for an additional fee. Free Wi-Fi is available throughout. The Cathedral Gate is just steps from the bustling Buttermarket and the cathedral precincts. The city is home to numerous high street shops and restaurants, which are within a 2-minute stroll. 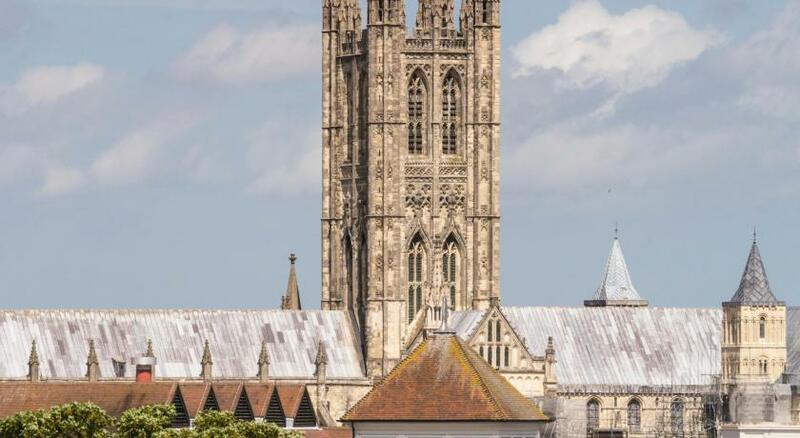 Canterbury West and Canterbury East Railway Stations are both just 15 minutes’ walk away. When would you like to stay at Cathedral Gate? This room offers a TV, telephone, hairdryer, and tea and coffee making facilities. The room has access to a shared bathroom. This room offers an private bathroom, a TV, telephone, hairdryer, and tea/coffee making facilities. Please note all our rooms are nonsmoking this also includes the use of e-cigarets. Please note all our rooms are nonsmoking this also includes the use of e-cigarettes. 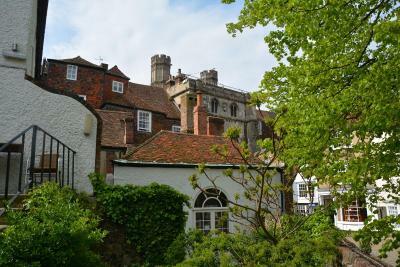 The Cathedral Gate hotel is a small, independent hotel that provides guests with friendly customer service in a historic building dating back to 1438. House Rules Cathedral Gate takes special requests – add in the next step! Cathedral Gate accepts these cards and reserves the right to temporarily hold an amount prior to arrival. Please note that the cathedral is undergoing refurbishments work at the rear and underneath the hotel. Works may take place from 08:30 to 17:00 Monday to Friday. Please note that due to the nature of the building, there is quite a lot of stairs and no elevator. The hotel is in a central location in the pedestrianized city center, however, guests are welcome to drive to the hotel's front door for unloading prior to parking. Parking vouchers for the public car park cost GBP 6 for 24-hours parking. From 18:00 to 10:00, parking costs GBP 2. Baby cots are provided upon request only. They are not guaranteed until confirmed by the hotel. Easily disturbed by other guests. Too warm room. Beds were a bit rickety. Tiny bathroom. Very friendly and helpful staff at the reception as well as breakfast room. Good location next to cathedral. Quirky old building with charm. Clean. Coffe and tea facilities in the room. Spacious room. Location right by the cathedral. Comfortsble room in the rambling building. The staff and the great continental breakfast brought to my room. Having to go outside to get to room and very noisy with room facing the street. Even though earplugs provided had to listen out for alarm so couldn’t use them. Very small wardrobe - definitely not enough space for two. Lovely staff. Very friendly. Delicious fruit salad with breakfast! Wonderful place with interesting history. Breakfast in the room for no charge was a lovely touch. Location couldn’t be more central. Very helpful and friendly staff. Nothing. All was good. If you are infirm the three flights of stairs to the upper levels and the sloping floor in the dining room might be problematic. I had a room with a shared bathroom which might not be to everyone's satisfaction but this was not an issue for me as the bathrooms were spotless and regularly checked. Had the inclusive continental breakfast. Best fruit salad, coffee and croissant I had had in years. I was offered more... The view from the dining room down the historic streets was wonderful. Truly great location. 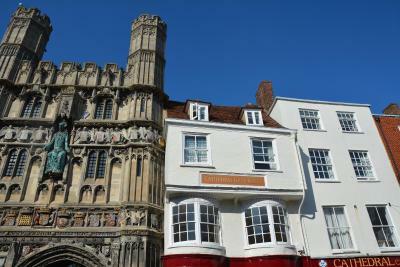 Perfect for a short or longer stay in historic Canterbury with the most central convenient location. less than 10 minutes walk along the city wall form the Canterbury East railway station and even closer if you travel by bus. Highly recommended if you like quaint! There isn't much not to like about this place. 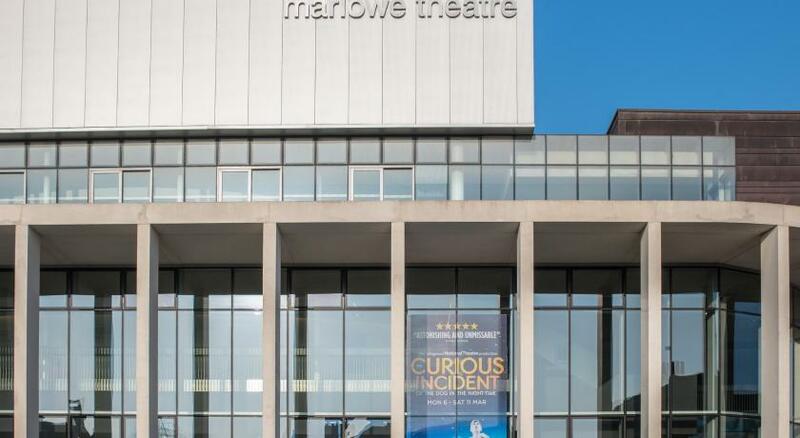 The location is the best in Canterbury. You step outside onto a beautiful square with lovely shopping streets jutting off it. The Cathedral is also located next door! The hotel is quaint and beautiful. The staff are very helpful and friendly. The bathrooms were refurbished to a high standard and spotless although they are shared and this may not be to everyone's liking. It would have been nice to get a pot of tea with our breakfast and some extra milk. There are tea and coffee making facilities in the room but only a few of the tiny UHT milk cartons. We were going to the ballet and wanted to make a night of it. We had stayed at the Cathedral Gate on several occasions 5-10 years ago. We were very impressed with the improvements and refurbished decor. It was spotlessly clean and the bed was comfy. We had the continental breakfast that was delivered to our room and this was very nice. The staff were friendly and helpful and the new bar area was relaxing and nicely decorated. The location is superb for exploring Canterbury.